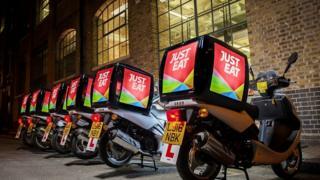 Just Eat's £200m plan to take over rival food delivery service Hungryhouse faces a hurdle. The proposed deal has been referred for an in-depth investigation by the Competition and Markets Authority (CMA). Both companies take online orders from customers and act as delivery middle men between them and restaurants. However, the CMA is worried that the combination of the two companies could mean worse terms for the restaurants. The probe will run until November this year. Earlier this month, Just Eat noted that the CMA intended to begin an in-depth investigation and said it was "committed to demonstrating to the CMA that the market is, and will remain, competitive following completion of the proposed transaction". The home delivery sector is a hotbed of competition, with Uber and Deliveroo also active in the sector. Just Eat began in Denmark in 2001 but is now based in London. As well as spending £200m on the Hungryhouse deal, Just Eat announced in December it was planning to expand in Canada by taking over SkipTheDishes there for 110m Canadian dollars (£66.1m).